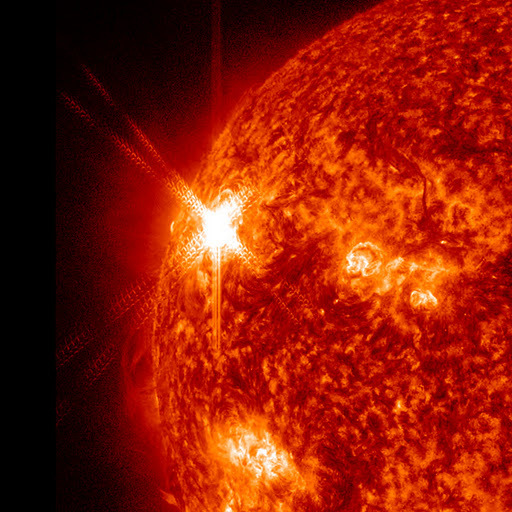 Full SDO cadence (12 sec) movie of the M2.5 flare and associated CME from June 7,2011; composite of AIA wavelengths 211 (red channel), 193 (green), and 171 (blue); 05:00–13:00UTC; 2400 frames (300 frames per hour). Images are rotated 90 degrees for a normal aspect ratio. It took 236 GB of hard drive space, 5 minutes of programming, and about 9 hours of processing on a 2.26GHz quad-core to create this. More to come! This entry was posted in Helioseismology, SOHO, Space Weather. Bookmark the permalink.